Teaching Others to Teach Themselves. Studies show the number one factor to personal happiness is the pursuit of personal growth. Stockton Training and Consulting recognizes this truth and embodies it in their mission to create a learning environment or culture wherever they go. We help individuals and companies become resilient to change by teaching them how to teach themselves. A process that constantly needs to be repeated in life, maintaining a positive attitude throughout and capitalizing on the things you do best. In other words, using your strengths on a daily basis. In the corporate setting we use the simple on-the-job training (OJT) model of Tell-Show-Do-Review. We emphasizes the role of the manager in both the Tell and Review phases. 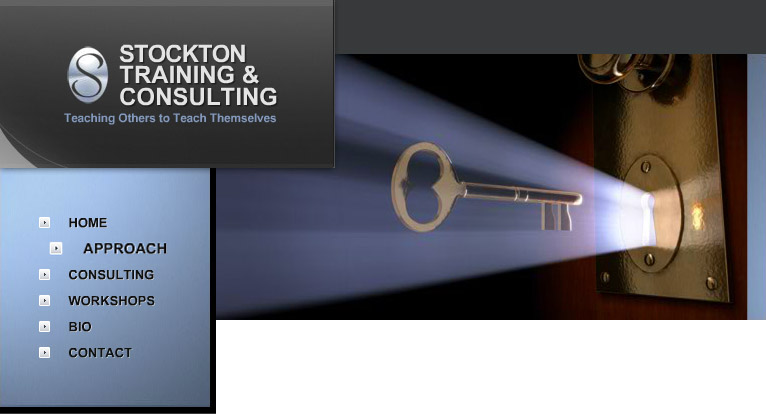 The major focus or niche of our work is in developing the manager into an employee’s coach. Meanwhile, the employee is learning and developing their necessary skills on their own. Throughout this process, both individuals realize the importance of continuing to learn and grow. They strive to continue to feel the energy that comes from mastering something new and being the best in the world at it and they begin to create a learning culture in their organization, so it can be resilient to the change that is certain to come. The same pattern holds true if you are an individual, through personalized strengths coaching you, too, can become the best person you can be.